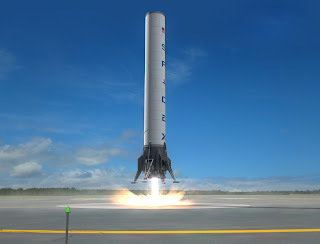 Space Business Blog: Will the Reusable Falcon 9 Kill the Suborbital Launch Industry? Will the Reusable Falcon 9 Kill the Suborbital Launch Industry? With SpaceX’s announcement this week that the company would not only develop a reusable first stage for its Falcon 9 family of rockets but would make a completely reusable rocket system (I will use Clark Lindsey’s nomenclature: "rF9" for reusable Falcon 9), I have been wondering about the future of the young NewSpace companies developing reusable suborbital rockets. Will companies like Masten, Armadillo and to a lesser extent XCOR and Virgin Galactic, survive this incursion from a well-funded NewSpace Cousin? SpaceX has announced the company is developing the “Grasshopper,” a 100 foot-tall suborbital Falcon 9 first stage that SpaceX’s cadre of young, talented engineers will use to test this initial piece of the rF9. SpaceX has NOT announced any intention to commercialize the Grasshopper. But if Masten, XCOR, and Armadillo continue to delay bringing a product to market that can reach 100KM, and SpaceX continues to develop products in its typical rapid fashion, might customers ask to buy payload space on an upcoming Grasshopper test? Or would SpaceX be willing to sell Grasshoppers to operators who then provide a suborbital launch service to users using the Grasshopper all before Masten has reached 100KM? Could the unmanned Grasshopper be modified to carry passengers and compete with Virgin and XCOR? If an operator came with funding, wouldn’t SpaceX take their money to make the modifications to "manrate" Grasshopper? But the big money is the orbital market. 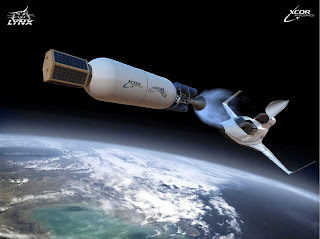 Most of the suborbital companies have expressed interest in using their suborbital experience and even their suborbital vehicles to expand current offerings to include an orbital system. XCOR has published this image of an orbital capability. Virgin Galactic even took investment money from the Middle East to jump start their orbital program. Could an rF9 meet all market demand for both suborbital and ultimately orbital launches as well? And if they do, are the current suborbital companies doomed? How cheaply could SpaceX really launch their new rF9? We don’t know. SpaceX does not even know yet. But we can make some interesting estimates. The heart of these projected orbital price reductions stems from reusing the rF9 like Southwest reuses its 747’s (which can fly commercially for 30 years with proper maintenance). How many reuses is SpaceX planning on? At this point, the best data I have is a nugget SpaceX's CEO, Elon Musk, said this last week that he is targeting $500K trips to Mars as a market for his reusable craft. Assuming a 47-flight amortization, what could be SpaceX’s breakeven price per KG to LEO? Or to say it another way, how low would the suborbital company’s prices have to be to beat SpaceX? All maintenance and between flight costs are included in the launch price. Based on these assumptions, SpaceX's breakeven Price to LEO for rF9 is $130 per KG or ~$1.4M per flight. Again, here is a table to summarize how I came to this conclusion. At the end of this post is a link to an interactive spreadsheet where you can modify these assumptions to create your own analysis. What if the rF9 doesn’t get 47 flights per vehicle? What if between-flight maintenance costs for the rF9 are significant? What if payload capacity has to be significantly reduced to accommodate rF9’s reusability elements? What if near term launch demand is not high enough to fly as often as they need? So how can XCOR and Masten compete? I continue to be bullish regarding the utility of Nanosat-class launch vehicles. When suborbital companies start offering orbital services (a second generation service), their initial orbital offerings would probably be within this Nanosat class - broadly speaking, payload space significantly under 100kg. Is there still a market for suborbital companies to offer this type of orbital service? Even if SpaceX may be able to now match (or beat) them on price? Be easier to "fly full"– to get the $130/KG price on an rF9, you have to wait for the manifest to fill. Not so with a smaller vehicle. XCOR was talking about a payload of 12-20KG initially. Be easier (and cost less) to maintain. Be launched with less integration or preparation – this advantage is the BIG one. XCOR talks about multiple flights on the same day, taking off and landing from existing airports. Even if the rF9 could launch that often, it will be some time before regulations allow SpaceX to fly that often - especially if they are still flying from the Cape or Vandenberg where ops tempo is measured in "launches per month" not "launches per day". Nanosat launchers are the future, but only if their ops tempo is fast enough to justify paying a premium for preferential launch windows. This advantage of the small won’t last forever. SpaceX will keep improving its initial RLV offerings. Spaceport operations will grow to allow for more airline-like ops tempos. So Nanosat launch operators (today’s suborbital companies) will have to keep improving too. But there is a market for Nanosats and it hinges now on ops tempo. There is hope. …is in the near term. I mentioned earlier, I doubt SpaceX will pursue commercializing their Grasshopper suborbital vehicle. But they may be open to selling this suborbital vehicle for others to operate. Such a suborbital operator flying the Grasshopper would have tremendous suborbital market advantages and could be a major competitor to those suborbital companies focusing on suborbital research (Masten, Armadillo, etc.). Suborbital companies should be worried, but not panicking. If the reusable Falcon 9 hastens the development of viable Nanosat launchers, the industry will be doubly blessed – low launch costs from the rF9 and high ops tempo from Nanosat launchers. Here is the interactive spreadsheet so you can build your own rF9 assumptions. so, the total cost per launch (so far) of a "reusable Falcon-9" is in the range of $5-8 million, that put the payload price-per-ton to LEO at around 8-12 times less than the price of an expendable Falcon-9 and NOT 1/100th of the price! well, if we consider all the extra-costs, extra-mass and extra-issues listed above, the REAL price-per-ton carried to LEO by a reusable Falcon-9 might be in the range of 20-30% the price of an expendable Falcon-9 and NOT (absolutely NOT) only 1% of today's costs!!!!!!! in other words, an expendable Falcon-9 may cut the costs of the access to Space by a factor of 3-5 times, but absolutely NOT by a factor of 100 times and NOT EVEN by a factor of 10-20 times!!! so, does it worth the efforts, time, costs to develop a reusable Falcon-9 ??? Good commentary. But maybe it's simpler even to say that the XCORs and Virgin Galactics are in the end much more likely to achieve an order of magnitude higher flight rate than a rF9 or any other vertically launched traditional rocket concept. The first and foremost answer to truly sustainable space is flight rate; even more than reusability , or trying to focus on cost (though all are obviously related). It's easy to imagine that a single XCOR or Virgin vehicle alone could have a higher flight rate than the entire Falcon system in a year. And they are also more flexible, able to operate from many, many more locations. There is also the issue one derives from watching Branson's actions: for the CCDEV competitors, he partnered with the spaceplane competitors - SNC and Orbital - and NOT the capsule competitors. T guy who know s something about running high-frequency scheduled airlines knows which configuration is most likely to succeed on that score. We need innovative competitors in all segments. Elon is trying it from the traditional rocket/capsule/orbital approach, and then seeing if he can make that truly economic and eventually high flight rate; essentially starting at the top (orbit) and working his way down. Our suborbital buddies, and the NASA CRuSR program, are working from the other direction: Trying to get very high flight rates, with all that that requires - high operability, low to no maintenance between flights, very high reliability, etc. etc. - and doing that first with suborbital; eventually building up to doing it with point-to-point, and orbital. I'm glad we have both strategies in play.